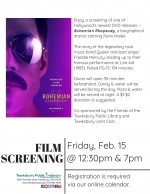 Enjoy a screening of one of Hollywood's newest DVD releases -- Bohemian Rhapsody, a biographical drama starring Rami Malek. The story of the legendary rock music band Queen and lead singer Freddie Mercury, leading up to their famous performance at Live Aid (1985). Rated PG-13. 134 minutes. Doors will open at 6:30pm. Pizza & water will be served. A $2 donation is suggested. Co-sponsored by the Friends of the Tewksbury Public Library and Tewksbury Lions Club.